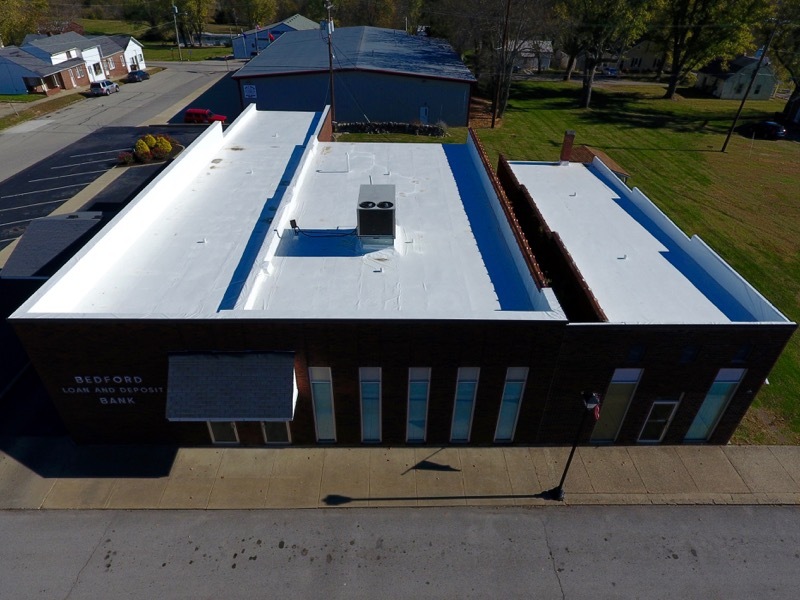 The three distinct sections of flat roofing on the Bedford Bank and Loan in Bedford, Ky all had one thing in common, they were all three in desperate need of flat roof repair. Water had began leaking in the masonry wall cap and running down the parapet for some time as well as leaking into the seams of the old roofing. 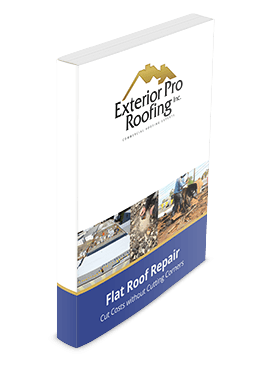 Exterior Pro was called in for advice on what the best flat roofing option might be and the cost associated with each option. 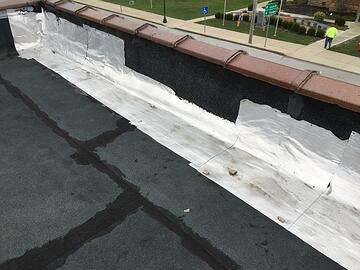 One of the best flat roof repair methods is to recover an old flat roof with a new PVC membrane. This is a long lasting flat roof repair option that is much less expensive than a full tear off and much less disruptive. The Bedford bank was a perfect candidate for a flat roof recover because, even though the existing roof had some leaks, it was not totally saturated. Just one area on the east section was wet enough to warrant a tear off. 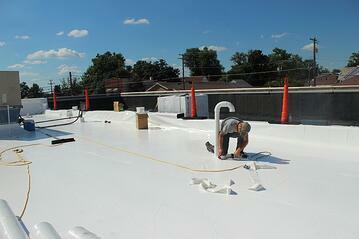 Keeping the tear off to an isolated area also helped keep project cost down. The flat roof recover took about a week in total. 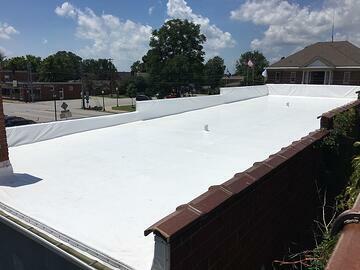 The new white PVC roofing membrane, was ran up the walls and brought over the top to completely encapsulate the roof. 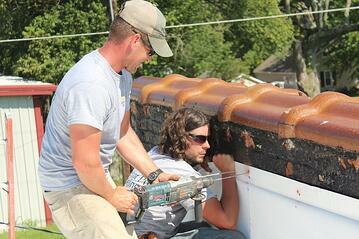 Then, a new metal coping was installed to replace the old ceramic wall caps that the bank used to have. Not only did going up and over the walls eliminate the leaks, the new metal trims helped give the bank a more modern look. The flat roof recover on the Bedford Bank received a 20 year warranty and new air vents were installed in the roof to let the building breath. The project went well and Exterior Pro was able to clean up the roof and removed unused pipes, vents, and old satellite antennas. Less things up there, less things to cause leaks.